The demand for air travel continues to be high, with airlines reporting a double-digit growth in domestic passenger traffic in the first nine months of the year. Experts said the induction of bigger sized aircraft in domestic routes triggered an airfare war among key players and played a major role in boosting domestic passenger growth. 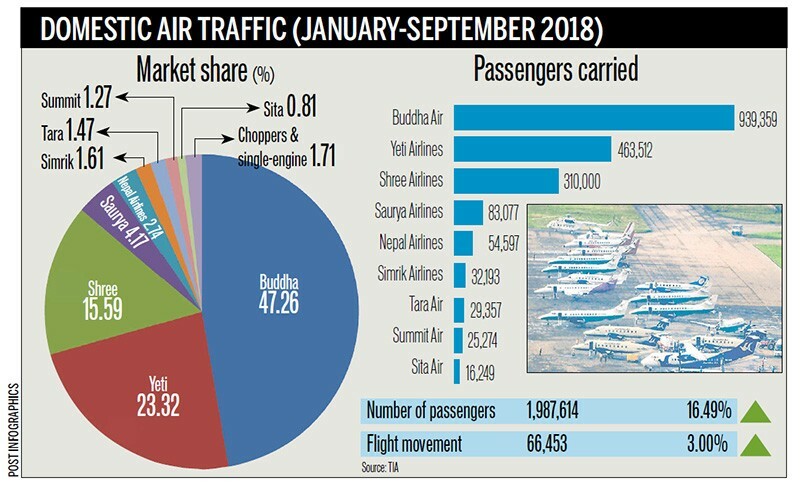 According to the data of Tribhuvan International Airport (TIA), the country’s domestic passenger traffic grew 16.49 percent to 1.98 million in the January-September period of this year. The figure includes 33,996 passengers flown by helicopters and single-engine aircraft. Flight movement increased 3 percent to 66,453 flights. This means on average, Nepali skies saw 246 domestic flights daily. The growth has been propelled by the entry of Shree Airlines as most of major carriers’ passengers have declined in the review period. Airlines officials said that fares remain subdued this year compared to a year-ago and that made flying cheaper. Ghanshyam Acharya, spokesperson of Airlines Operators Association of Nepal, said that there were two key factors contributing to passenger growth—induction of bigger sized aircraft and the Civil Aviation Authority of Nepal (CAAN) move to open key airports during the night. The second reason for the growth is that most of the airports in Nepal have been serving during the nights. The night facility is currently being provided in Kathmandu, Dhangadhi, Nepalgunj, Bhairahawa, and Simara airports. Despite the growth in passenger numbers, most of the airlines suffered negative passenger growth. Leading carrier Buddha Air also recorded negative growth. The carrier flew 939,359 passengers in the first nine months of 2018, down 2.13 percent as compared to same period last year. Buddha’s closest rival, Yeti Airlines, recorded a staggering 24.44 percent growth in passenger numbers. It flew 463,512 passengers in the first nine months of the year. Start-up carrier Shree Airlines flew 310,000 passengers in the first nine months of this year. The carrier, which began operations in August 2017, has obtained approval to add three Bombardier Q400 turboprop aircraft to its fleet. sharpest drop in passenger numbers, according to the TIA statistics.